You are here: Home / My Books / No TV? No Fair! The Rule: No TV, no computers, no video games. For one whole month! Chloe Lambert is so angry, she’s seeing red. But soon her fiery red turns to a simmering orange, and finally to a laughing yellow. In fact, Chloe even begins to wonder if life would be better if there were no more machines! But when something happens to her good friend Mr. Z., Chloe has to decide: Are machines good for us or bad? Read an excerpt from No TV? No Fair! Chloe Lambert’s mom switched off the TV. Chloe scrunched up her face as she stared at the blank screen. She was in the middle of watching her all-time favourite show, The Taylor Twins. Jake and Josh Taylor were just about to perform their latest hit song, “Heartbreak Summer”. Chloe’s face suddenly became unscrunched. Her eyes got very wide. Her mouth dropped open. No TV for a month? She was so surprised, she couldn’t say a word. Her mom must be joking! Chloe checked her mom’s face. She wasn’t joking. Chloe’s older brother Mark stormed down the two steps that led into the family room. What’s he doing in here? Chloe thought. Mark still had seventeen minutes left in his turn on the computer. Chloe knew this because in exactly seventeen minutes, the computer was all hers. Mark slumped onto the couch beside her. His dark, messy hair hung in his eyes, but Chloe could still see the grouchy look on his face. Grouchier than usual, that is. Mark was thirteen and, according to Chloe’s parents, suffered from “perma-frown”. Chloe’s dad followed Mark into the family room and stood in front of the TV beside their mom. Chloe’s parents were still in their work clothes. Her mom was dressed in a navy skirt and a white blouse, and her dark hair was pulled back. Her dad wore a grey shirt tucked into black dress pants, and had his glasses on. He usually only wore his glasses for work, and Chloe always thought they made him look serious. In fact, at that moment, both her parents looked like they meant business. What? Chloe’s mouth opened even wider. No computer, either? It was bad enough that Chloe had to live without The Taylor Twins, My Two Crazy Lives, and Rock School, just to name a few of her favourite shows. But they wanted her to give up her computer games, too? Who is “No TV? No Fair!” for? I wrote this book for young readers, but I hope that parents will enjoy the story, too! With humour and heart, this book takes a look at what happens when a modern family decides to turn off their TVs and computers for a month. (Hint – everyone struggles at first, even mom and dad!). You’ll laugh and sympathize with ten-year-old Chloe, who goes from hating the rule (“no fair!”) to trying to convince her friends to unplug all of their machines. Will Chloe really give up technology forever? Purchasing a copy of No TV? No Fair! You can ask for No TV? No Fair! 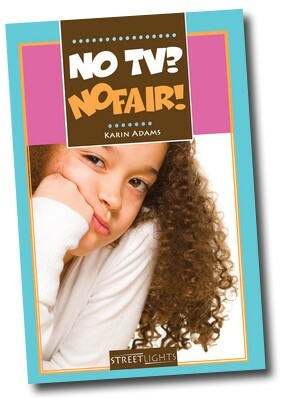 by Karin Adams at your favourite local bookstore. It is published by James Lorimer & Company Ltd. and distributed by Formac Lorimer Books in Canada, and by Orca Book Publishers in the USA. ISBN10: 1-55277-471-6 or ISBN13: 978-1-55277-471-7. “No TV? No Fair!” is carried by most major booksellers around the world! To find an online seller in your country, or just want to see more shopping options, you can do a web search for “No TV? No Fair!” by Karin Adams.